Lunar New Year holiday is just around the corner. While the word “holiday” may cheer some up, there are also those who don’t welcome the season. The two big traditional holidays in Korea, Seollal (Lunar New Year) and Chuseok (fall harvest holiday), mean days of kitchen labor for many Koreans, particularly married women, to prepare food for their families and their ancestors. But with the popularity of ready-to-eat meals increasing steadily, food companies are looking to Seollal dinner tables as their next potential market. Lotte Department Store has unveiled a ready-to-eat menu for upcoming Lunar New Year holiday. According to the retailer, the dishes are 20 percent cheaper than those prepared at home. GS Retail’s affiliate Simply Cook has launched four set meal items for the holidays, promoting them for guest-invitation use. The packed meal sets include holiday dishes and can be ordered through the retailer’s mobile platforms. Single-person households are big customers during the holiday season. According to BGF Retail’s CU, the nation’s largest convenience store chain, packaged meal sales increased by 26.4 percent at Seollal and 32.9 percent at Chuseok last year. This year, convenience store franchises are launching out special packed meals for Lunar New Year holidays, targeting single-person households who will be staying at home during the holidays. 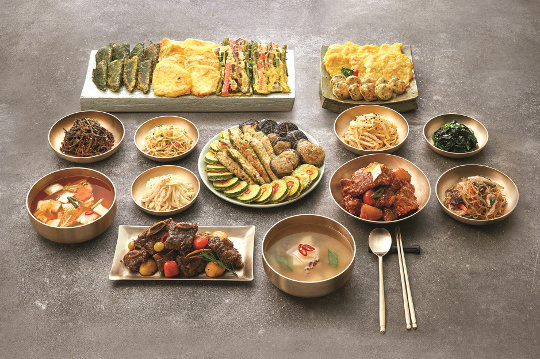 For example, GS Retail, another major convenience store franchise here, launched a packaged ready-to-eat meal for upcoming holidays, packed with traditional Seollal menu items.